With the presidency of French conservative Nicolas Sarkozy in jeopardy, worries that the alliance between Sarkozy and German Chancellor Angela Merkel (known as Merkozy), which favors austerity over massive fiscal stimulus in the Euro Zone, may be in jeopardy as well. Renewed worries that the regional debt crisis in Europe is worsening, particularly in Spain (and possibly in Italy) put downward pressure on the Euro Dollar last week. Conversely, the U.S. dollar index (DXY) appears to be in position to extend higher despite concerns that the economic recovery in the U.S. may be running out of steam. Importantly, the U.S. dollar index (DXY) is now approaching a test of primary downtrend resistance that sits at the 81.65 level. A break above this resistance would increase the likelihood of a possible extension up to key “cross” trend line resistance currently sitting at 87.25. 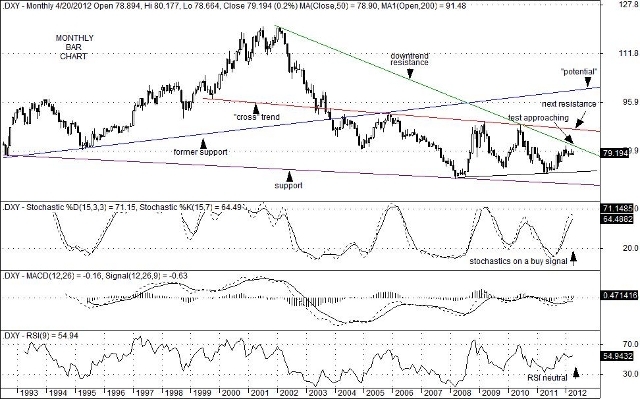 In recent years, history has shown that a rise in the DXY is usually accompanied by a decline in stock prices as well as an increase in price volatility. Further, a decline in commodity prices as well as drop in bond yields as usually associated with dollar strength as well. A failure to rise above 81.65, however, would likely help keep equity prices range bound until, perhaps, the November elections. That being said, it is important to the Euro Zone that growth in the U.S., as well as in China continues play out. It would be a stabilizing influence on the European economy as their self imposed austerity measures get their debt ratios down to manageable levels. A decline or a significant slow down in either the U.S. or China could instead frighten investors globally. This entry was posted on Tuesday, April 24th, 2012 at 11:20 pm	and is filed under U.S. Dollar Index (DXY). You can follow any responses to this entry through the RSS 2.0 feed. You can leave a response, or trackback from your own site.